The IT help desk has an important role to play in the smooth running of your company. Your organization relies on the IT help desk to provide advice, troubleshoot and resolve information technology issues in a timely manner. When your help desk is running efficiently and smoothly, your clients will report high levels of satisfaction. You can achieve this by optimizing your help desk for success. Whether you are just starting out with a help desk, or you’re reviewing your existing arrangements, setting some goals will help you to optimize your service. You won’t know if your efforts are going well f you don’t determine metrics that you can measure. While employees will usually let you know by way of complaint when things aren’t running smoothly, that still won’t let you see performance metric such as how long it is taking for problems to be resolved. Reports can help you stay on top of the biggest IT trends that face your company as well as your industry. They can show where the biggest users of the help desk are coming from and identify, for example, where some staff may need extra training or even if your help desk staff are being stretched thin and you may need to hire more people. Considered a best practice for help desks, the 1-4-24 rule relates to time frames for problem solving and resolution for more challenging issues. Acknowledge a client’s issue within one hour, work on it within four hours and aim for resolution within 24 hours. People hate feeling like a number. While sending automated responses to help desk tickets is important for productivity and saving time, you should rewrite these email templates to sound more human and approachable. 5. How easy is it to contact the help desk? Are your contact details buried deep on the intraweb? If you offer chat support online does someone have to click on several links just to get to you? Are there too many phone choices greeting a client when they call up the helpdesk and want to speak to a person? Consider simplifying these for a better user experience. When a major issue or outage takes place, your help desk is affected as many people at once attempt to make contact, reporting the same issue over and over again. 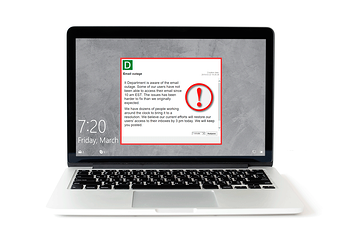 With DeskAlerts you can quickly and easily send pop-up notifications straight to the screens of affected employees advising of a known IT issue and when a resolution can be expected. This simple process will free up help desk staff to work on a resolution as well as dealing with other unrelated issues. A good way to sort through all the different tickets your help desk receives is to assign them with specific attributes and rules. For example you can set some just for the CEO or for particular projects with looming deadlines. This can help you to set prioritis.